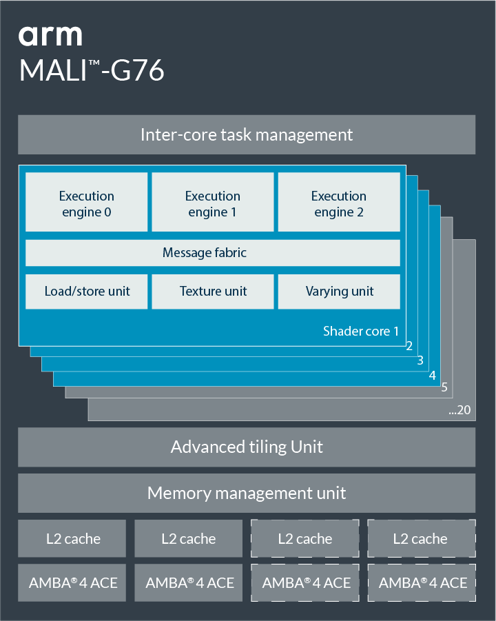 The ARM Mali-G76 MP10 is an integrated high-end graphics card for ARM based SoCs (mostly Android based). It was introduced in late 2018 in the Kirin 980 (e.g. Mate 20 Pro). It integrates 10 of the 20 possible cores and is based on the second generation of the Bifrost architecture. According to ARM it offers improvements in the machine learning efficiency and a bigger tile buffer for 16x anti-aliasing. Compared to the old Mali-G72, the G76 should offer twice the performance per cluster. Therefore, the G76MP10 should be slightly faster than the G72MP18 e.g. in the Exynos 9810 (Galaxy S9). The GPU supports all modern graphics APIs like OpenGL ES 3.2, Vulkan 1.0, OpenCL 2.0, DirectX 12 FL11_1 and Renderscript. The ARM Mali-G72 MP18 is an integrated high-end graphics card for ARM based SoCs (mostly Android based). It was introduced in early 2018 in the Exynos 9810 (e.g. Galaxy S9). It integrates 18 of the 32 possible cores and is based on the second generation of the Bifrost architecture. According to ARM it offers improvements in the machine learning efficiency and a bigger tile buffer for 16x anti-aliasing. In our benchmarks it slightly below a Adreno 540 and is therefore suitable for demanding mobile games.